With all the energy I've been expending related to food allergies I was especially fun to receive this e-mail from the Food Allergy Network. "Bella Cucina is recalling 'Death by Chocolate' cookies due to undeclared walnut." Which came first, the name or the nuts? Got home today & hooked up The Boy dragger and rolled 2 ¼ miles to U6 soccer practice. The association selects teams geographically. Apparently we’re the ones who live close enough to not have to drive. Watched a U6 kid get kicked in the face…careful bending over to pick up your ball, boy. Just another reason not to use your hands. Ever. My The Boy took a ball full on to the nose. He came running to me for comfort and got intercepted/picked up by an assistant coach. I thought it was gutsy of her to do that. Dude, at soccer, your coaches are in charge. I posted about receiving the Lunatic Biker sticker. I have the special gift from Jim @ Hiawatha Cyclery scanned over there at the right. Want a sticker? E-mail me! I have 1.5 and 3 inch sizes available. I’m not sure how much I like them. The logo is circular but the minus sign upsets the balance of the logo and the sticker. Oh well, you’re getting what you pay for. Maybe version 2.0 will be better. They’ll still be free so get one now and get one then. The old guy in the grocery store thinks I make pretty good time on the bicycle. Apparently he passed me on the way and by the time he came across me in produce I’d already bagged two apple fritters, my chai tea latte was poured and I was looking for my daily dose of local veggies. The one who poured the latte – she’s intrigued…or just practicing good customer service. What do you do if it rains? I get wet. The woman at the register wanted to know if I'd ever done RAGBRAI. Once. She's from Rock Rapids, boy that's a crazy ride! I asked her to try to remember the 9950 people just like her who were standing there gawking at the 50 making it crazy. A co-worker passed me on the road. She said she knew honking hello wasn’t a good idea. She said she was a little uncomfortable passing me on the bridge. I said she could have waited behind me (there’s a pinch point that’s maybe a 100 ft long). She said she wasn’t THAT uncomfortable. When I got home I attched The Boy dragger and rolled empty, also pulling an empty bike for the other The Boy...and we all rode home from school together. These are what some people call inconveniences. If you've been reading this for a long time you know that The Family occasionally deals with food allergies. If you're a new reader, why? I haven't posted for a week! How could you be a new reader? The highlight of last week was his first special diet school lunch. At work I watched the clock pass 11:30 and breathed some relief as it appeared that all the hard work and coordination paid off. 10 minutes later the phone was ringing and he's in the office throwing up, swollen eye, and some hives. That made for one inspired bicycle commute from work to school. Coincidentally The Local Daily published an article Friday (and more Saturday) that some local schools have banned peanuts. Their website includes a forum for every article. There's plenty of "the needs of the few spoiling it for the many" sentiment. So, my internet minutes are getting used up over there right now. "Ride your bike, tithe your gas money." The Wife alerted me to the presence of a Snakebite in the local daily. He's racing across the state tomorrow (Friday) in the Highway 212 Gut Check. That's 412 (plus road construction) miles with a 48 hour time limit. The race is a fundraiser to fight Crohn's disease and ulcerative colitis. Last year there appears to have been two solo racers. This year there are 19! The accompanying picture contains his new fixed gear bike. MinusCar friend Kevin Brady is also competing. Good luck guys. I hope all goes well! This video is making the bicycle advocacy rounds. It's a San Francisco Police training video describing bicyclist rights and responsibilities, although I think it's VERY light on bicyclist responsibilities. I find myself wondering how far removed my SFPD is from making a video like this. I understand a video encouraging helmet use is in the can...but this video seems like it would be a big stretch to do locally. A goal for 2008 perhaps? Today the cable gets canceled. I wonder how long it will be before I can blog again. This morning I loaded up The BOB Trailer and headed for the FAB Coffee Doughnut ride. Two weeks ago we had a record 10 for the ride. Today we had a record 3. 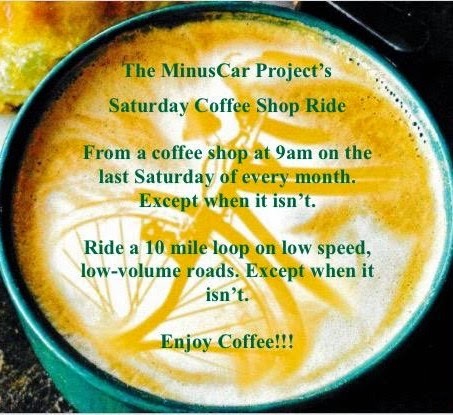 I questioned the FAB Ride Director about the scheduling of a weekly Saturday morning road ride at the same time. “If that’s the ride they prefer, then that’s the ride they prefer.” There he goes, giving people what they want. Sheesh. I, Mr Bite and KW headed for The Farmer’s Market. I was pulling t-shirts for 30 people with hopes of getting in some post-ride delivery. Later Michelle’s was the eatery of choice where full orders of biscuits and gravy were thoroughly enjoyed while one of Sioux Falls' most prolific songwriters regaled us with tales of Friday night's observation of street level plate glass window shattering hand-to-hand combatting. Here we were joined by The Snakebite SO and, with no need to return to the place of ride origin (FAB rollers ride to the ride), turned the ride into a t-shirt delivery ride. For the next three hours we enjoyed last night’s cigarette smoke and mixed drinks (Coke and water) at Ken’s Northside Country Club (it used to be a bar), visited The LBS and The Owner prior to lunch at the Hy-Vee Super buffet…and stopped at 21 residences in central and eastern SF to deliver FABRAD t-shirts to participants. 35 miles later I had an empty trailer, some decent conversations with deliverees and I didn't know why my thumb hurt. Want to know how to visit 21 residences by bike in the most efficient manner possible? Make a dot-to-dot with The Google Earth. I’m halfway done with local shirt delivery…if anybody else wants to go riding. Via C.I.C.L.E. - "Kayaking to Work Offers Ad Agency Employees Exercise and Serenity"
"The trim, 55-year-old body of this gray-haired, bespectacled graphic artist wanted a new way to reach his office at Mullen, a Strip District advertising and public relations agency. Three years ago on Father's Day he got it when his wife, Tina, and his two sons, Simon and Luke, bought him a 9 1/2-foot-long kayak." The Living On Liquid blogger pointed this article (Man Rows to Work, Leaving Car Behind) out to me today. It's about a 63-year-old man who bikes and rows to work. Very cool. Intersting that I could almost pull this off myself...if there were certain infrastructure items in place. "He rides one bicycle from his home in Cheverly to a boathouse where he keeps his 21-foot-long fiberglass rowing shell. He rows 6 1/2 miles, then rides another bicycle from the river to his job at the Library of Congress. The whole trip takes about an hour-and-a-half." When he got out of his car and into the water something changed for him, "His intimate perspective on the river has led him to get involved in the Anacostia Watershed Society, a local environmental group, and to 'adopt' a piece of shoreline that he keeps clean." His overall point is that government has failed the people. I listened to Barbara Kingsolver today too. She’s written a book (Animal, Vegtable, Miracle) about her family’s experience of eating only local food for one year. There’s some pretty excellent stuff in the transcript.